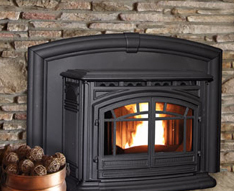 Cal Stove has a wide range of gas fireplaces with many exclusive features such as the industry leading “EmberGlo” burner system, “HeatFlo” heat transfer system, “Bankers Brown” brick liners, the “Sherwood’s Home Collection” of face options, and much more. All of our products are available for Natural Gas or Propane. 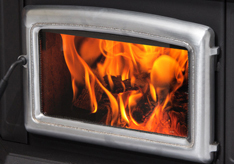 Pellet Stoves take efficiency and reliability to a new level. They’ve combined the knowledge gained through years of experience with the latest in technological developments. With today’s rising costs of other fuels, wood pellet fuel has remained low, making it a very affordable and desirable alternative to heating your home. 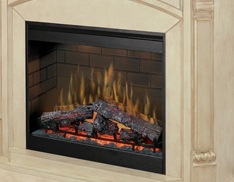 It has been many years since we have harnessed electricity and now you can have the best in electric fireplaces as well. Since electric fireplaces need no ventilation the way traditional fireplaces do they can be used in a wide variety of locations and can be installed without costly construction on your home. You just plug them in and let the heating begin. Electric fireplaces are easily moved from one location to another so you can take them with you if you move, go off to college or simply if you need to warm up a cold guest room. A 120 volt outlet is all that’s needed and you can have the warmth and comfort of a dancing fire in seconds. 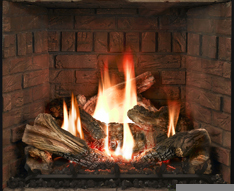 Electric fireplaces also require no cleaning since there is no dirty soot and ash to worry about and they don’t pose a danger of flying embers catching your carpet on fire.